It is truly hard to believe that 12 years have passed since the very first RIP event hosted by Carl over at Stainless Steel Droppings. Faithfully and devoted to this annual event, Carl took one leadership break during that time, and this year, blogging has changed for him and the reins are now with the good Andi's and Heather's hands. These are two fantastic ladies who have been a part of the community for such a long time, bloggers who I read with fascination over their reviews and thoughts. I commiserated with them on books or authors who didn't live up to what was expected, or debated with others when we felt that a book was deserving of high praise. Life has changed. So much. It has for me over these past seven years since I first started my humble site. Like Carl, I've waned in participation and eagerness to write and post. Mind you, I still read voraciously, but it's a different mix of what I used to delve in. I've given birth to a beautiful now almost four-year-old (!!) son and I've also gone through Stage 3 breast cancer 3 years ago, which resulted in a double mastectomy, chemotherapy, radiation, and two reconstruction surgeries. The breast cancer was not caught early; it was instead caught in time. Thank you, God. Every year, I return for my annual scans and every six months, I have my blood tested. The fear of the unknown is only fun when it is in a book or a film; never when it is in real life. I miss the book blogging community. I miss the camaraderie and adventure it felt like we were all having as we received books from publishers or authors, as we dug into the tales and communicated out into the world what our thoughts were. I miss the simplicity and the fun of it all. Life has gotten in the way, sometimes good, sometimes bad. But at the end of these days, each adventure is for something good, right? It might be painful, it might be frightening, but we learn a little more about ourselves each time and we persevere just a step harder on any challenge. We become more so who we truly are as each year goes by. This is my long rambling intro to the fact that while I rarely post today, even though I've read some phenomenal books, I always, ALWAYS will post about this challenge. This is the season of each year I always love. The changing leaves, the cooler weather, the change in coffee options. Granted, I live in North Florida and we do get cold weather, but nothing like the old days of when I lived in Baltimore, Washington, D.C., or even St. Cloud, Minnesota. But I still remember. I love this annual event. It is a nostalgic feel to dive back into the typing, the reading, the watching of scary stories, and then to put them all onto my tiny corner of the blogging world and wait for the occasional comment or two that comes up. Gone are the days of "so many comments that I can't keep up" time. And I am okay with that. To some extent, right? If you've not heard of this annual event celebrating all things that go bump in the night, head on over to Andi and Heather and Carl's blogs for the intro! And let's start getting scared! In a good way, of course. Goal: read and have fun - this isn't really a challenge, of course! 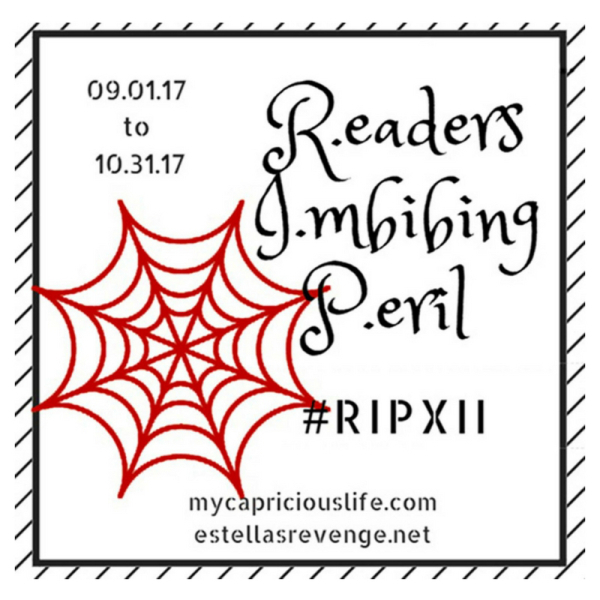 Peril the Second: Read two books of any length that you believe fit within the challenge categories. Peril the Third: We all want you to participate. This Peril involves reading one book that fits within the R.I.P. definition. Peril on the Screen: This is for those of us who like to watch suitably scary, eerie, mysterious Gothic fare during this time of year. It may be something on the small screen or large. It might be a television show, like Dark Shadows, or your favorite film. If you are so inclined, please post links to any R.I.P.-related viewing you do on our book review pages as well. Peril of the Group Read: This year we will read and discuss Slade House by David Mitchell! We plan to post discussion questions on October 1 on our respective blogs, and you can answer them at your leisure, and as you like! If you post on your blog, link up. If you post on Twitter, Insta, etc. use #ripxii. In addition to, or instead of, these group read options you may want to host your own. That would be welcome too and if you choose to do so please let us know so that we can advertise them for you. Again, you may participate in one or all of the various Perils. Our one demand: enjoy yourself! You have gone through a lot of life changes. I see your posts on Instagram and am always so happy you have such a supportive husband. Have fun with the challenge. It is one of the best events of the year, isn't it? Have fun and happy reading!